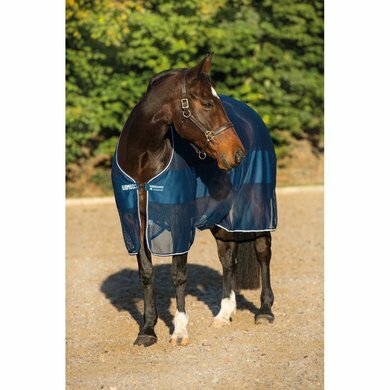 The Rambo Block Net Cooler has mesh (airy polyester fabric) in the blanket that is smaller than with a traditional sweat blanket / fly rug, so the blanket retains its perfect fit! 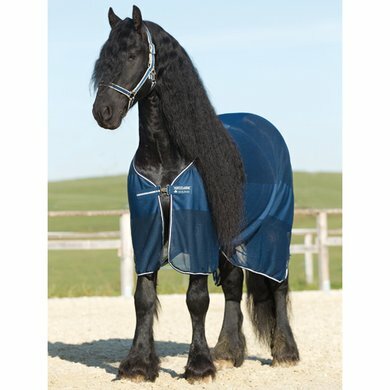 The blanket is good to use after driving and during transport to let your horse cool slowly on hot days with an air circulation around his body. Suitable as sweat, fly and transport blanket. The blanket has a single hook / eye closure on the chest and is equipped with a single (hidden) belly girth so that the blanket stays in place. In addition, this blanket has a leg strap and comes with handy laundry / storage bag. 75% would buy this product again. Excellent quality at a very reasonable price. Way too long and out of model.